DETROIT - The baseball, awash in white cowhide and disappointment, landed on the grass in short right field, ending Josh Beckett's no-hit bid at 6 2/3 innings. Beckett was untouchable until Curtis Granderson ended all the fun, attaching a "1" underneath the hit column on the scoreboard, and turning a night for the ages into simply a 10-5 win over the Tigers. Beckett's brilliant performance came in front of a crowd of 29,240 that was driven out of Comerica Park last night the moment David Ortiz pulled into second base with a two-run double in the eighth. Boston scored six runs in the eighth to put away the Tigers and today will attempt to sweep their first road series of at least three games this season. The Tigers, though, got a bit of revenge in the eighth when the Sox made errors at second, shortstop, and third, and Kevin Youkilis left the game after being kicked on the right ankle by Josh Anderson. "He was spectacular," said Mike Low ell, a longtime teammate of Beckett's who said last night was as good as he's seen the righthander. "I really thought - I know there's little bit of luck and everything - but he just had such good stuff, I really thought there was a chance he was going to throw a no-hitter. Once we got past the sixth, I was like, nine more outs. You're kind of counting them down." Beckett was aiming for the fifth Sox no-hitter since 2001. "I was locating [my fastball] well. I think I threw enough strikes early with my curveball to establish it," Beckett said. Asked how close he'd come to a no-hitter prior to last night, Beckett joked, "I think I took one into the second one time before this. I don't know. It wasn't very deep, I don't think." As the Tigers stepped to the plate in the seventh inning, it appeared this would be their best chance, with their Nos. 2, 3, and 4 hitters coming up. But Placido Polanco flied to left, Magglio Ordonez walked, and Miguel Cabrera - who had entered the game tied with Youkilis for third in the majors in hitting at .358 - got himself down 0-2, before flying out to Jacoby Ellsbury in the right-center gap. It was Granderson's turn, and he made the most of it. The center fielder lined a solid single into right field, the no-hitter going by the boards on a 2-and-1 pitch, what Beckett described as a 94-mile-per-hour sinker. "He hit it good," said Beckett. "It wasn't a very good pitch." That hardly diminished the incredible stuff the Sox ace was slinging, including an unfair curveball. "He was throwing strike one when he was throwing offspeed," Lowell said. "Just hitting corners. It seemed like he really never missed over the middle. With his stuff, he's got enough velocity where he can miss over the middle a couple times and still get away with it. I don't think he gave too many guys any easy looks." The closest Beckett came to allowing a hit in the first six innings was on a bunt attempt by catcher Gerald Laird in the sixth. The ball rolled foul just short of the third base bag, with Lowell scooping it up, and Beckett's no-hit bid safe. Beckett then got Laird looking at a nasty curveball for strike three. "That's part of his game," said Beckett, who hit Laird with a pitch in the eighth. "You look at the scouting report, he generally tries to do that in his second or third at-bat. It wasn't that big a deal." The chance for a perfect game was gone early, as Polanco walked with one out in the first. After Polanco, no Tiger reached until Ordonez's walk on a full count in the seventh. Beckett went 7 2/3 innings and allowed three runs, all unearned, while walking two and striking out nine. He got plenty of run support as the Sox scored two runs in the first when Dustin Pedroia led off with a single, and J.D. Drew followed with his 200th career homer. Two more Boston runs came home in the fifth as Nick Green drove in Ellsbury from first with a double. 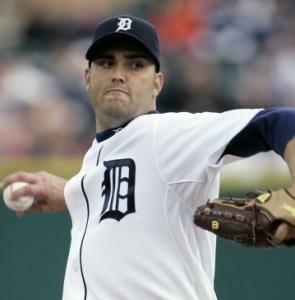 Green later scored on a funky play on which Tigers righthander Armando Galarraga was charged with interference when Green attempted to score on an overthrow. The Sox broke it open in the eighth, scoring six runs, including two on a bases-loaded double by Ortiz. Those runs became necessary when the Sox allowed the five unearned runs in the bottom of the inning. Takashi Saito struggled in the ninth, loading the bases, but did not allow a run. When Jason Varitek was asked afterward if he realized Beckett had a no-hitter going, he broke into a smile. He did. He knows how good Beckett has been lately - allowing just three earned runs in his last four starts. "I'm locating my fastball," Beckett said in a bit of an understatement. "Good things are happening."